Facebook’s real name policy saga has been rumbling on for more than three years now, when it first claimed this wasn’t going to rolled out on a broad scale. Since then, they’ve asked our US editor Natt Garun to provide a pronunciation of her name, been ordered to allow Germans to use whatever name they want, shut down someone who was truly called Ai Overdrive and been phucked over by someone not called Phuc. We’re firmly committed to this policy, and it is not changing. However, after hearing feedback from our community, we recognize that it’s also important that this policy works for everyone, especially for communities who are marginalized or face discrimination. That’s why we’re continuing to make improvements in this area. But today, bowing to significant pressure, the company has launched a new process in the US for those who may require “special consideration,” specifically people from the LGBTIQ community, those who have a non-Western name, or people who may have been a victim of abuse. 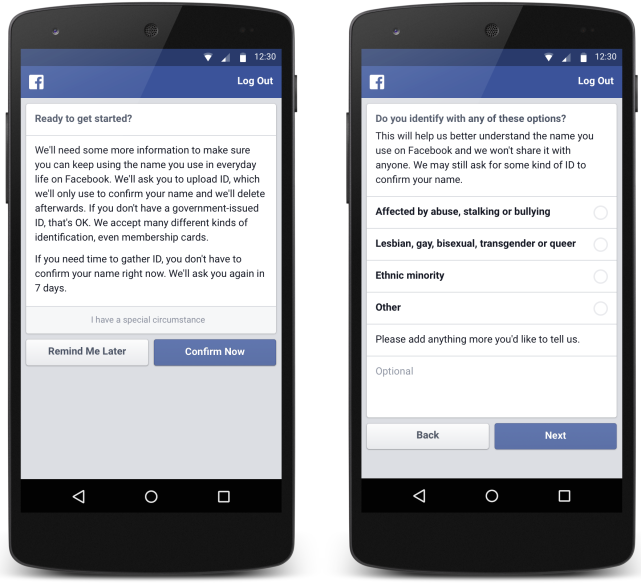 Facebook now suggests that people can “use the name their friends and family know them by,” which opens up the possibility that they are allowing certain groups to use the names other than the one they were born with in these circumstances. A team of real people is also on hand in the background to provide more personalized support in these situations, whether that be to use a pseudonym or not. Although they at the same time claim that real names “make it harder for bullies to anonymously smear the reputations of others” it’s clear they’ve met with responses to the contrary. In order to cut down on false reporting, the company is now making it harder for people to report each others names as fake by asking them to go through several stages when making their report. The tools are currently being tested on a limited basis in the US but Facebook says it will roll out globally after looking at the feedback.